I have watched many of my family members suffer with hip pain. Hip arthritis is a condition my mother suffered with and just recently my five year old son complained of rapid onset hip pain which was diagnosed as passing inflammation. He thankfully recovered quickly however it highlighted how crippling hip issues can be. It can affect our ability to move freely in day to day life. It can also impact sleep quality as we struggle to lie on the affected side. Hip pain can have a number of causes which can involve the joint, soft tissues around the hip or may be referred from the spine. 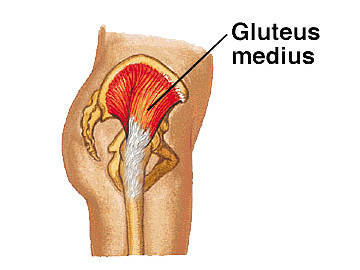 In my day to day work I have found that the cause often lies with an issue with the tendon of the gluteus medius muscle. Tendons are the tough fibres that connect muscle to bone. The outer side of the pelvis is where the gluteus medius muscle is found. Having mixed results in treating these people in the past, I was keen to better understand this condition and find ways to help people move freely again. Being called hop –along by family members as you limp your way through life quickly loses its novelty. The first step was understanding how tendons work and what goes wrong. In a nutshell tendons are bundles of parallel fibres (mainly collagen) forming a rope like structure. They join muscle to bone. When injured, some of the collagen breaks down. Your body will try and repair the tendon. If the tendon continues to be overloaded degeneration will occur. It is at this point that people present to the clinic with their painful hip or shoulder or ankle or knee. To enable the best chance of healing we initially look at reducing the forces acting on the tendon. In a practical sense this means pulling back on activity levels, strengthening the body and avoiding the postures and habits that hamper healing. Hips need good nutrition. Although under researched, oral supplements of Vitamin C, MSM, bromelain (pineapple enzyme) and high quality protein show promise in helping tendons improve. Best results are achieved when each case is looked at on an individual basis. There is no one treatment regime that works for everyone. In Osteopathy structure and function are inter related. As structure improves, bodies heal better, function improves and smiles return to faces. Keep an eye out for future blogs and if you need some hip help call Radius Clinic on 93794151.